Huffman worked to bring MAX light rail line to town, along with numerous other accomplishments. 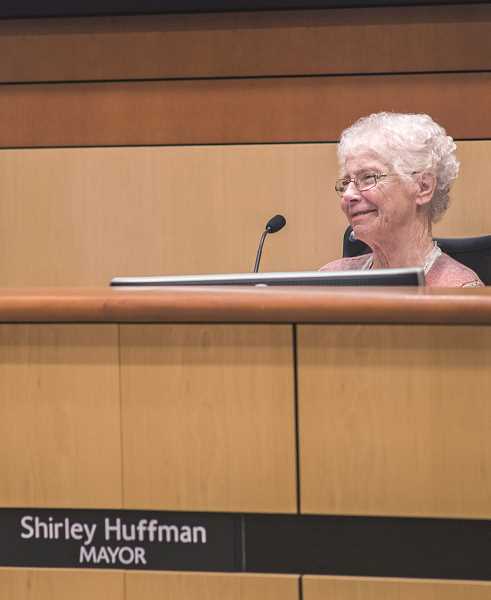 Shirley Huffman, Hillsboro's first female mayor and a tireless advocate for the city, died Sunday, July 1, at age 89. Huffman died of natural causes at her home in Ventura, Calif., according to The Oregonian newspaper, which first reported Huffman's death. At Hillsboro's next City Council meeting, Tuesday, July 3, councilors plan to observe a moment of silence in recognition for Huffman's life. Afterward, people wishing to share a few words about the former mayor are encouraged to speak. Born Shirley Todd on July 22, 1928, Huffman grew up in Dayton and moved to Hillsboro with her husband Thomas in 1954, where she worked as a paralegal and office manager in his law firm. She served on a handful of city advisory committees in the mid-1970s and was eventually appointed to the City Council in 1978. She served six years on the Council before running unopposed for mayor in 1984. She ran unopposed again four years later. "Shirley was one of the most humble, selfless, and visionary public servants I have ever met," Hillsboro Mayor Steve Callaway said on Sunday. "I am honored to have called her a friend, and I am personally indebted to her leadership." Callaway said Huffman's legacy can be seen across the city. "Her importance to our community cannot be overstated," he said. Huffman helped oversee a pivotal time in Hillsboro's history. When Huffman joined the city council in the 1970s the city had fewer than 30,000 residents — the size of present-day Forest Grove. The city doubled in size by the end of Huffman's final term as mayor. Many of Hillsboro's signature businesses moved to Hillsboro during that time. Intel opened its doors in Hillsboro in 1979 with the completion of the Hawthorn Farm campus, followed by Jones Farm in 1982. Construction was continuing on Intel's massive Ronler Acres campus when Huffman left the mayor's office in 1993. Huffman was known for her tireless advocacy for the city. She worked 40 hours each week in the unpaid part-time position, and fought to extend Hillsboro's mayoral terms from two years to four years so she could work harder. Huffman is best known for her work to bring MAX light rail service to Hillsboro in the 1980s. She lobbied hard to bring the MAX to downtown, against the wishes of regional planners, who conceived of the line ending at 185th Avenue in Beaverton. Huffman traveled to Washington, D.C. to lobby Congress directly, and had tough words with the head of the Federal Transit Administration to extend the line, telling The Oregonian in 1990 that she "had to get a little stern" with him before he agreed to the extension. The former president of the League of Oregon Cities, Huffman supported a city beautification effort known as Operation Picture Perfect. As mayor, Huffman launched Hillsboro's Sister City program in 1988 with Fukuroi, Japan. As a City Councilor she championed two bond measures which built the Shute Park Aquatic & Recreation Center on Southeast Maple Street. She spent eight years on TriMet's board of directors and received the Hillsboro Chamber of Commerce's Distinguished Citizen award in 1993 after leaving office. She later served as the Chamber's economic development coordinator. Huffman's work is commemorated in plaques across the city. TriMet added a sign to the Hillsboro Central MAX station in downtown in 2000, saying Huffman's "vision and leadership brought MAX to Hillsboro, linking the region and its people together." 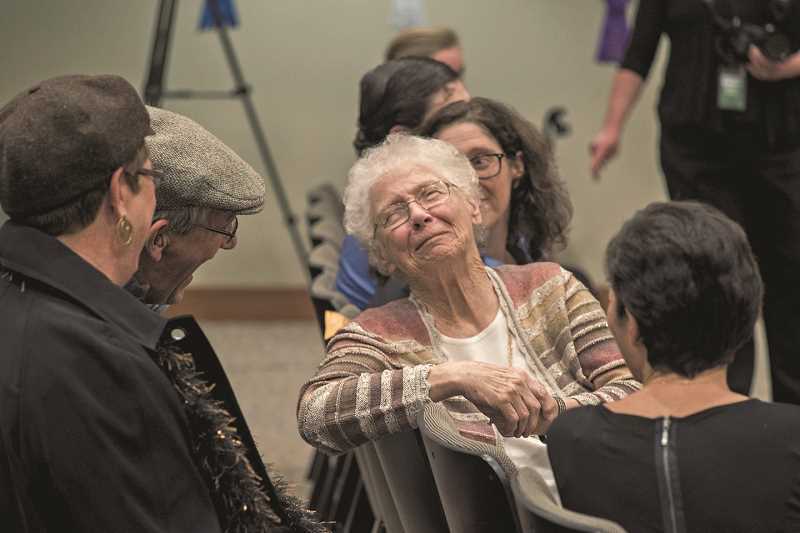 In 2015, city officials "brought Shirley home" naming the Hillsboro City Council auditorium in her honor. It was the second public space named after Huffman. A room in the Washington County Public Services Building also bore her name prior to 2015. The building was previously shared by the county and the city of Hillsboro. "Many of the things we take for granted in Hillsboro, such as the MAX line continuing past 185th Avenue to Downtown, the large presence of high-tech industries (and) the high quality of city of Hillsboro services all are a product of her leadership," Callaway said. A memorial service for Huffman is being planned for later this month.